Prev How To Reduce Gift-Giving Stress During the Holidays Next How will your holidays be affected by the economic crisis? This Thanksgiving we’ll be serving up a heaping helping of gratitude. Though the historical meaning of Thanksgiving is a little murky, giving thanks is always a good exercise for children. In these lean times, simple is better. 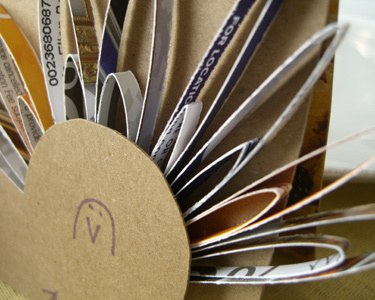 So here are a couple of recycled crafts to get children involved in the Thanksgiving festivities. From planning the menu to setting the table, children enjoy being part of the process. Our five-year-old loves to talk about what should be served and can practice her writing skills by creating a menu. Young kids can also help out in the kitchen. By giving them manageable tasks like tearing the lettuce, pouring the ingredients, stirring, or cutting mushrooms with a butter knife, they will enjoy cooking with you. Folding napkins in a new way helps build their motor skills while keeping them busy. 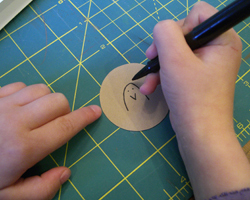 Children can also help decide the seating arrangement and make place cards. 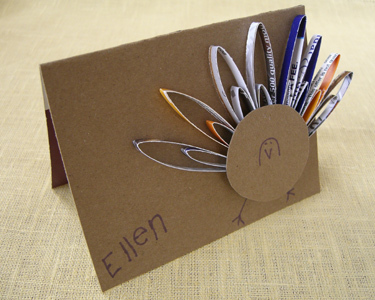 These Thanksgiving recycled place cards are fun to make and will add a personal touch to the table. 1. Cut cereal boxes to 5″x 8″. You’ll need one for each place card, so you can get about two cards from each box. 2. Score the printed side of the box in the middle. Fold over and put under a heavy book to press flat. 3. 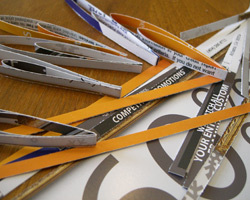 Cut card stock mailers in 1/4″ strips. 4. Fold down about 1 1/2″, wrap around and fold again. Glue in place. Continue until you have all the “feathers” made. You’ll need 6-8 feathers for each card. 5. Glue feathers together and allow to dry. 6. While you’re waiting for the glue to dry, go ahead and have your child write the names on each card. 7. Fan out the feathers. Dip the feather group in a pan of glue and place off-center on the card. 8. For the turkey body, cut 2″ circles from the cereal boxes. Have your child draw a turkey head and face on each circle. 9. Glue bodies on top of the feathers. Have your child draw some turkey legs. 10. Add one to each place setting. Amidst the holiday consumerism, it’s nice to think about the gifts we already possess, both tangible and abstract. This Jar of Thanks project will help your kids focus on the meaning behind the Thanksgiving holiday. Have each member of the family write down what they are thankful for and add it to the jar. You can go around the table and have each person draw a piece of paper randomly from the jar and read it aloud. Best of all, these jars are simple to make, almost free, and can be re-used after the holiday as fall votive holders. 1. 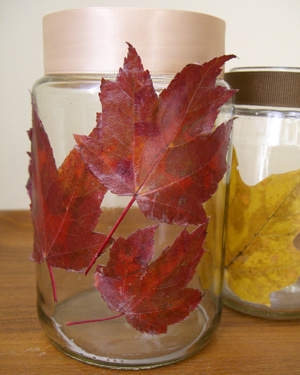 Brush leaves with decoupage glue and apply to jar. Brush a little more glue on top. 2. Glue some ribbon around the top. 3. 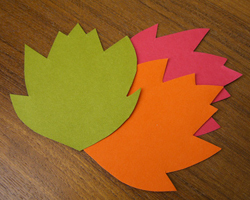 Cut out paper in the shape of leaves. 4. Place one leaf along with a pencil at each place setting for each person to write their thanks. Have a great holiday and enjoy spending this time with your children! Maybe you can squeeze in a nap sometime too. Oh how cute! Recycled from junk mail-super bonus! I’ll be linking to this. I love how you made the feathers out of junk mail–what a great idea. We are definitely trying this. Just found your site–glad I did!